On Nov. 15, the McMaster Alumni Advancement Committee organized a lecture and exhibit at the McMaster Museum of Art to highlight how the Bertrand Russell Archives made their way to McMaster University. Guest speakers included archives senior research associate Andrew Bone and archives librarian Myron Groover. The lecture focused on the significance of Bertrand Russell, how the archives made their way to McMaster in 1968, and the significance that McMaster holds as the home of the Bertrand Russell Archives. Before the archives arrived at McMaster, there was much speculation internationally as to who they would be given to. In 1967, Bertrand Russell gave his work to the Bertrand Russell Peace Foundation, a charitable organization that he was a part of, and left it to them to ultimately decide who to sell the archives to. There were two conditions upon which the organization would consider when choosing a potential buyer: that the material end up in an institution open to the public, and that the papers and library of his work stay together at the same institution. Cambridge University in the United Kingdom was the biggest contender for the eventual home of the archives, but the opportunity faded fast when the funding did not materialize. Another strong contender was the Harry Ransom Center at the University of Texas at Austin. The deal put in place with the Harry Ransom Center eventually fell through and gave way to McMaster’s chance at owning the archives. In 1967, McMaster was a small, recently secularized institution, and was mostly known as a science, technology and engineering school. McMaster had recently made headlines for its ownership of a nuclear reactor on campus, which is still located on campus today. “McMaster humanities needed their own nuclear reactor,” said Groover. McMaster was determined to acquire the archives through the combination of public and private funds and was eventually able to make it happen. As a result of this purchase, McMaster expanded and drew attention to its philosophy department, which grew rapidly after the arrival of the archives in 1968. Today, McMaster is home to the archives, library and copyright to the unpublished works of Bertrand Russell, making up one of Canada’s foremost rare book archives. 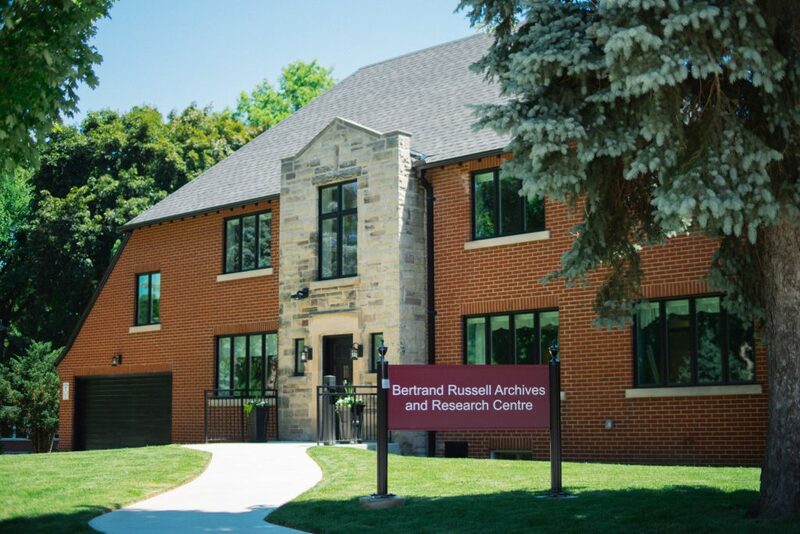 McMaster continues to expand its collection of the archives of Bertrand Russell and has devoted the campus to the home of Bertrand Russell’s life’s work and memory. “You can’t overstate the import of this acquisition and this archive to McMaster both as an institution and as a home for research,” said Groover. In addition to advancing research at McMaster, the archives have also attracted researchers and historians from across the globe. The new Bertrand Russell Centre, which houses thousands of original books and documents, opened this past summer and sits on the corner of Sterling Street and Forsyth Avenue.